I work in clay and make smoke-fired vessels. I love the 3-D aspect and the journey in the making process. There are many steps to complete a vessel. The highlights for me are shaping the clay on the wheel and finding the sweet spot where the vessel is just right, then working the vessel off the wheel to alter the shape and finally, hand-shaping the bottom so that it floats a bit on a flat surface instead of just sitting planted-like. Of course there is the final ceremonial dance with the fire of the kiln. Looking into the kiln after a firing, I experience the highs and lows of hopes, wishes and expectations. As I lift each out and examine its unique fire marks, I experience a lovely bonding experience with each finished vessel. Ruthanne Tudball (UK) for her thrown and altered organic shapes and Cathi Jefferson (BC) for her beautiful finishes reflective of nature and serenity. While my work looks quite different from these artists, something very special about their work connects with me and has for years. And, of course, there are the ceramic artists who smoke-fire and are so well celebrated in the book, Naked Clay, by Jane Perryman (UK). My husband and I have traveled to India and Indonesia. We visited potter’s villages and were fascinated by the primitive techniques still in use. I like the idea that I am connecting to that primitive vessel-making tradition, especially when I fire in an outdoor kiln where I supply the fuel, using wood shavings and not electricity, gas or propane. What is it that draws you? It is the spontaneous traces of the colour fuming and carbon imprinting which leave such beautiful marks on the vessels, both dramatic and subtle, that continue to capture my heart and soul. I am unabashedly in love with my smoke-fired vessels! I also love that the finished vessel reflects the medium – clay – and the firing process – in a more natural state, unlike one where the surface is glazed. I am interested in letting go of some of the functional pottery I still make and to focus on more organic, contemporary shapes for my smoke-fired vessels. Working in clay, especially on the wheel, is very physically demanding and I must respect my joints and physical strength. Also, the whole long process is fraught with setbacks, such as pieces that collapse during throwing, a crack emerging from drying too fast, or seeing a problem when it’s too late to correct. During one firing, a wall I created in the kiln caved in, destroying several vessels that represented many, many hours of work! One doesn’t ‘paint over’ a mistake in the clay process, one discards and starts over from the beginning. The courses I have taken and my work as an artist in various art communities over the years has brought me into contact with a lovely, eclectic group of individuals. I value the contact with and support of other artists and their interesting dialogues. Working in clay I strive for control of the process but bow to the gods who so often intervene to keep me humble. Over time I have learned to accept where the clay may take me and to celebrate new paths, which are often the result of accidents rather than planned work and progression. Sometimes sitting at the wheel can be like facing a blank page – wheel block – especially after a break from working with clay. Another is being inventive with shapes and not just repeating, although there is a certain meditative aspect to throwing a series of same shapes; but no two vessels are really the same – at least not for me! For the second year, I have a vessel accepted in Splash, the Arts Umbrella fundraiser. All such donated art goes on public display at the Pendulum Building in downtown Vancouver for the first two weeks of October 2009. I also have some vessels in Laura K. Jewitt Design on 10th Avenue. 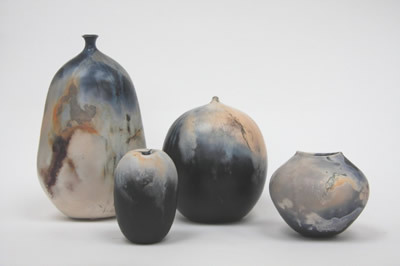 I’m very happy that my smoke-fired vessels are finding a niche in the art world. This has given me the affirmation of being an artist, something that came after a career in another field. Listen to my heart, don’t let my mind go faster than the clay, and recognize that the clay knows! Go for a walk or cycle to a favourite nature spot, do something different, but mainly, just start. Once started, the inspiration usually kicks in. Art is work and some days just going to work with the clay is the remedy for getting inspired. I use the internet, network with other potters, read, and perhaps take a workshop. I chose this image because the vessels came from the same firing and share similar characteristic markings from that firing. Although each can stand alone, they also work so beautifully as a family grouping.